I paint mostly in acrylic paint on canvas and paper. 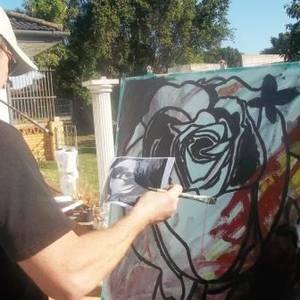 I am a professional artist working out of my studio in Port Elizabeth, South Africa. Having many styles allows me to move between subject, feeling and emotions.Working on a realistic subject another canvas will emerge with abstract ideas and vice verse. My art is influenced by what I see, hear and read. Commissions are undertaken with the full understanding that the end result is my style and my projection. Take it or leave it. There is no tweaking or adjusting. I use my own stencils that I've made over the years and reuse and hide them in new paintings. My daily life starts off actively with a cycle, run and swim. Then in the studio until supper time and then marketing on the internet.